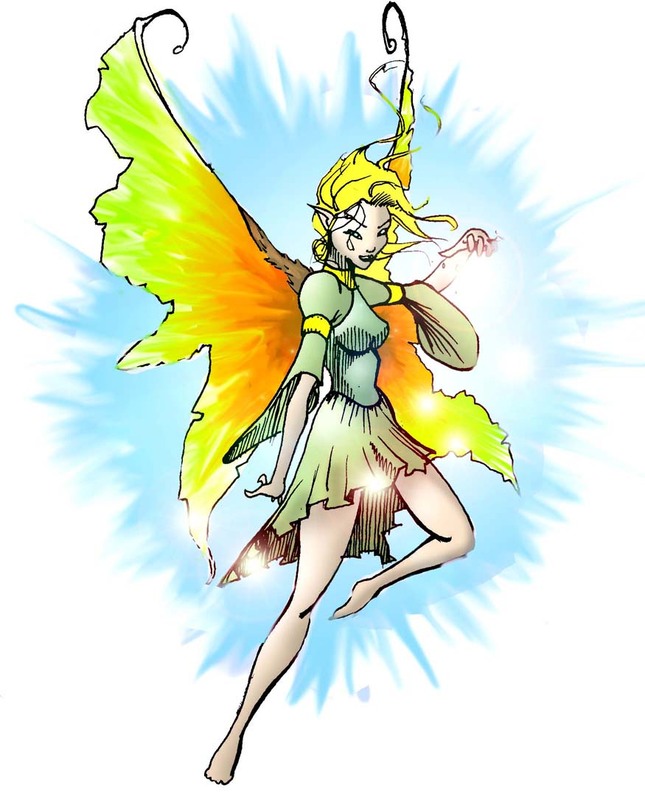 The Fae in “Song of the Ocarina” are nothing like this typical rendition (so beautifully crafted by Mark Pate). Instead, they follow the original mythology with very tall, magical beings without wings. “Lean back against this tree and repeat the tune I play.” Noel hummed a short haunting melody. Lark listened carefully, and memorized the melody as he played it the first time through. “Now, this time, listen carefully to the musical tones and how they tie into the environment.” She didn’t really know what he meant, but concentrated on the way the notes sounded as they interacted with the various natural surfaces around them. As he hummed and she listened, the sounds stopped resisting against the surface of the grass and tree trunks and started seeping through the foliage, becoming at one with it. How odd. As she played, she noticed the trees, grass, and flowers around her shimmering with what looked like heat waves. A tiny grey kiwi and a very black opossum snuck out from under cover and listened, noses quivering in the shady space. The music melded with the surrounding foliage and a magical, harmonious drone started as if from nowhere. As it emanated from the plants around her, rising and falling with the phrasing in her tune, everything began to glow with a faint luminescence. Noel studied her as she played, one hand leaning against the tree. Pinions of iridescent light spread outward from his shoulders, spreading up and out behind him. At the sight, she let the flute’s last note fade. She studied the energetic aura growing denser behind his back as it flowed together. The force took the shape of wings, but did not create actual appendages. Distracted by light moving all around her, she scanned the area slowly. Everything remained in its place, but the park somehow transformed into something new. Colors enriched, enhanced by a shimmer of energy. A quiet, melodic white noise hummed underneath the sound of the lake water slapping on the shore and the birdsong high in the trees. “It’s still Queenstown, but it’s not.” She peeked around, otherwise motionless. Lark’s eyes widened. “Spell… Plane of…” Like in fantasy books? Lark’s head spun. She placed two fingers on her temple. What was happening? Was she dreaming? Several points of light suddenly appeared under the bush occupied by the kiwi and opossum, and she took a sharp intake of breath. Two of the twinkling glow-points advanced toward Noel. Her eyes widened as they transformed from small dots of light into very tall, luminous beings; humanesque, but other-worldly. One evolved into a strikingly beautiful woman with a thick braid of jet-black hair. Leather armor, laced with green tooled leaves, graced her lithe form. She clicked a quarterstaff into a mechanical holder at her waist as she rapidly glided, rather than walked, toward Noel. This entry was posted in All Posts, Delfaerune Rhapsody, Words: Serious Play and tagged Ann Narcisian Videan, excerpt, faerie, fairy, fiction, Lark's Tale, novel, words.music.tribe by Ann Videan. Bookmark the permalink.